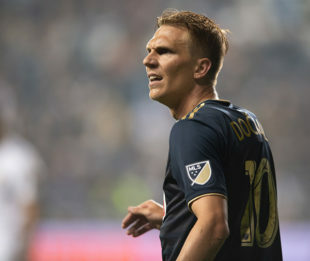 Ilsinho, Cory Burke, and Borek Dockal were all on target Wednesday as the Philadelphia Union defeated Chicago Fire 3-1 at Talen Energy Stadium. Ilsinho and Burke scored on each side of halftime before Dockal added a late penalty. Alan Gordon scored the lone goal for Chicago. Jim Curtin made three changes to the team that drew with New York Red Bulls last weekend. The ice cold C.J. Sapong was rested in favor of Cory Burke, Ilsinho slotted in for Marcus Epps, and David Accam started against his former club after Fafa Picault was forced to miss out through injury. The first quality scoring chance of the evening came for the Union in the 19th minute. Ilsinho was fouled 30 yards out on the right side. Dockal curled a ball into the box that was flicked on by Alejandro Bedoya near the penalty spot. The header beat Patrick McLain but pinged the left post before coming out. Auston Trusty latched onto the rebound, but his shot was deflected away. Philadelphia would come close from a set play again in the 29th minute. After a short corner routine on the right side, Dockal curled in another great ball that Mark McKenzie rose highest for, his header looked to be heading into the corner, but McLain did well to get low and push the shot away. The Union would take the lead just before halftime. Ilsinho latched onto a ball near the corner of the box on the right side. The Brazilian did brilliantly to elastico between two Fire defenders before firing a perfect shot in the far side of McLain’s goal from 8 yards out. The goal was the Brazilian’s third goal of the season, which leads the Union. Philadelphia would add a second just after the half with Burke’s second MLS goal in the 51st minute. A Union corner kick was partially cleared, and Ray Gaddis recycled the clearance back out to the right side for Dockal. The midfielder beat one defender, lifted his head up and curled a perfect ball toward the back post that Burke just had to put his head to to beat McLain from six yards. Chicago would pull a goal back in the 56th minute. Brandt Bronico drove into the Union box down the Chicago right after being played in by Aleksandar Katai. The midfielder simply squared a pass to Alan Gordon, who made no mistake, tapping in from seven yards out. David Accam would come close to finding the net for the first time this season in the 69th minute. Dockal was again the creator, curling in another beautiful ball from the right side. Accam beat McLain to the ball and pushed it around the keeper, but a defender was on the line to head away. Gordon almost found a second in the 79th minute. His diving header forced Blake down to this left to make a smart save. The Union almost found a third in the 82nd minute. Substitute Marcus Epps found Haris Medunjanin on the right side. The Bosnian curled in a cross, but Burke could only flick his shot wide from close range. Philadelphia would finally add the third goal in the 87th minute through Dockal. Marcus Epps did well again to find Burke running behind the Chicago backline and the Union striker waited for a Fire defender to commit to him and went down under the pressure. Dockal stepped up and fired the penalty into the lower left corner, sending McLain the wrong way. Burke for Sapong: It had to happen, and it worked. Burke did well to pressure for most of the match and did find his goal in the second half. Probably could have done a little better bringing others into the attack, but a good performance for the rookie. Skillsininho: What a goal to end the first half. A brilliant move and a fantastic finish. Accam: Where is he? Will the real David Accam ever appear this season? They had a bad stretch in the first and another in the second, but overall they played in control for most of the night. Good contributions all around. They aren’t a great team, but they are threatening to be a pretty good one. Good effort but pretty clear as to why Accam is not starting. Nice to see Dockal involved in all 3 goals and Burke in two of them. Also great to see a bit of squad rotation. Hopefully that will continue over the next 9 days. Any word on McKenzie’s status? McKenzie is getting an MRI son his knee. No news yet. I love the rotation, but there were some clear chemistry issues. Keep the rotations on a reasonable basis and they’ll all get used to playing together. Hard to argue 3 points. Harder still to argue 10 points in last 12. Hard to argue- the manager has saved his season. Hard to argue an unbelievable bit of pure Brazilian skill to make an otherwise snooze-fest first 45 memorable. Hard to argue Schweinsteiger is anything short of a brilliant player even though its pretty clear he’s had an MLS-ing of his game. His technical skill is otherworldly. Been rough on the RB over the last couple seasons and have been generally impressed with his game this year but defensively tonight Keegan was coarse… aluminum carbide coarse. Really poor in accounting for the whereabouts of his mark. Beyond that, I give the game a low graded grit number of about 40 in aesthetic value. rough one to watch. Not hard to argue about Schweinsteger…he was one of the two defenders that Ilsinho embarrassed on his way to goal. Was able to get down to the match tonight, and for the most part it was good footy. I had some newcomers with me, so a little Brazilian flair is already the best advert. Burke seems to understand where the ball should/is being played in to, and then attacks that spot. More please. What a game! We won a snooze fest with squad rotation and subbed out a central defender because of injury, yet didn’t give up another goal. Something a good team should do. Imagine if we can get a striker on a hot steak. As they head to Atlanta here is a thought, Blake hasn’t stolen a win for them this year….yet. Poor Accam. The guy is just struggling so bad. He’s better than this. At least I hope so. Enjoyed the game… nice night down there as well. Before Ilsinho took the souls of two Chicago players and put the U up 1-0 it wasn’t a game I was confident they’d win. Chicago is terrible, but per usual the Union had chances and didn’t finish. Regardless a win is a win is a win. 10 out of 12 points is solid. Have to stop going to sleep for stretches though. Against better teams you will lose. Burke – 2 starts, 2 goals. Has to be the starter now right?… barring rest needed for multiple games in a short period of time. Can’t just blindly go back to CJ. Where was Fafa? Rest? Thought he woulda been a nice sub toward the end to stretch it out. Also, hope McKenzie isn’t hurt. He and Trusty have been so good and are excellent with the ball at their feet. I think Fafa is injury after he came out early Saturday. My problem with Accam is he’s not hustling at the right times. There were a few times Blake looked to send him deep like he does with Fafa and Accam was just kind of standing there rather than trying for the fast break. Accam can play next Tuesday against Richmond. Maybe playing against a USL team will help him. Absolutely Burke should be starting. If it’s even a question in Jim’s mind at this point, I’m worried. Even the blind Tommy Smyth saw that Burke gives the Union something different. Yeah, intelligent runs, better than average touch, as someone else said, he knows where the play should be played and goes there, does the defensive work and is good in the air. I’ve defended C.J., and believe he does bring a certain something. This team, this MLS, demands something more, and Burke provides that. How about giving both some starts so as not to wear either of them down? Burke is a better player than Sapong. There’s not question about it. It’s not even a form thing as far as I can tell. Burke should be starting the majority of games unless Sapong gets incredibly hot. I like CJ a lot. He does a lot of dirty work that just doesn’t show up in highlights, stats, or tracking. Positive attitude, high energy hustle, gives his all. That having been said, after watching Burke’s first 20 mins as a sub earlier this season, I turned to our friends in the surrounding seats and we agreed THAT guy should get a shot up top immediately. The cross from Dockal? CJ isn’t going to be on the end of that pass; he’s been 1-3 feet from being on the end of that pass for almost 3 seasons now, with two or three exceptions (if that many). Burke has read that pass several times over now and been right on the spot like it’s in his DNA. Burke’s quality with the ball at his feet, particularly in traffic, is MUCH higher than CJ’s (we almost never get to see CJ with the ball at his feet for more than a touch anyway because of the way he plays his role). Corey’s ability the maneuver, with the ball, around and away from 2-3 guys hacking him smacks of a super-sized Ilson. That quality in the scoring area opens up so many more opportunities for teamates as well. CJ just lost his job. He’ll be a fine, high energy sub and I would not complain to see him get the occasional 3 games-in-a-week rotational start. But make no mistake, he just lost his job. Starting to see why they signed Dockal. Took a bit longer then we would like for him to show his ability, but it is showing now. Gaddis has 2 assists in 4 games. Man has been eating his Wheaties or something, yeesh. I can’t say anything negative about Ilson. Good take, pal, hell of a goal. I’m desperately hoping McKenzie is just knocked. It was a great play he made on the goal, but we also laughed at him later on when he tripped over the ball. Watching the replay, it seemed that the mechanics were that the Fire player went knee to McKenzie’s RIGHT knee, but that caused McKenzie to torque his LEFT knee, which is what he was holding while down and limping on as he left the field. That looks more like a structural thing in the left knee, which has me concerned for him. He was looking good, and I hope that I am wrong about the whole thing. Maybe just a sprain or strain. This is what I thought I saw as well. The left knee looked like it bent in a way it shouldn’t. Hoping for a hyperextension or strained ligament, not what I’m afraid it might be. That was an ugly game. The Union’s attack seemed very off. I guess changing the front three is likely to do that. Credit to Dockal, he has been great as of late. This was not a pretty win, but good job Union for getting it done. On to Atlanta, which should be a quite interesting game. Atlanta has looked very human recently. Winning the games your supposed to win regularly is the first step to respectability. This month they are doing that, if they pick up a point in Atlanta, that’s a huge bonus. Burke is the better option up top for an offense run by Dockal. C.J. just doesn’t make the necessary runs to play lone striker with a true 10. I have always felt C.J. is best In.A two striker formation as the second option who holds up play and poaches rebounds. I’ve complained about Curtin and called for his head, but he is using his depth and playing his kids. Now that Mendanjunin, Dockal and Bedoya are looking more like a unit and less like mismatched pieces the team appears to better coached than it looked a few weeks back. This team may be on its way to being a solid mid table team. If they play defensively like they did at RedBulls at Atlanta we should be ok. We are trying to be Red Bull/Columbus lite. So maybe a 1-1 draw. Crossroad Approaching soon…….Accam has not fit into any line up. He has to be moved this season for his own good and the Unions own good Sapong has had 1 goal. The Union need a different quality finisher who can mesh with the starting midfield. Burke has shown the most promise but he is just not enough. They need to make a move during the midseason trading period to improve the team. If they don’t make a move Sapong should not start again unless Burke cant play. Admit you made the wrong move Ernie and cut bait with Accam.